FREE Bella B 2 oz Silk & Honey Baby Lotion With Maternity Skirt Purchase on This Page! 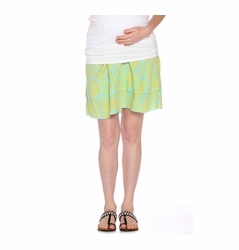 Maternity skirts are a great option in your wardrobe! Pair a pencil skirt with a silk maternity blouse for a professional look or wear a tank with a long maxi maternity skirt for the ultimate casual outfit. Show off your style with stylish designer skirts. Maternity skirts are a great staple for your wardrobe. 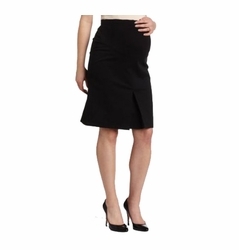 For work, choose a sophisticated pencil maternity skirt or a classic a line paired with a cute blazer. On the weekend, relax in a maxi skirt or show some leg with a short denim maternity skirt. Underbelly, fold-over or full panel waist styles will keep you comfortable throughout your pregnancy and often double as both maternity clothes and post pregnancy clothes. Some maternity clothes work really well during and after pregnancy, especially designer maternity skirts. A lighter version of our Silk & Honey product for moms. It's smooth lotion feel--l versus a thicker cream--makes it easy to rub in, and leaves skin wonderfully fresh and moisturized. Non-irritating and hypoallergenic. The Larissa skirt from Seraphine is a stylish black knitted maternity skirt that will flatter your bump with its fabulous fluted cut. A versatile must have - you can wear under the bump as a knee length skirt, or over the bump as a mini! Pair it with a tailored white maternity shirt for a polished professional look, or tone it down with tights and a comfy sweater to keep warm and cozy on a casual winter outing. 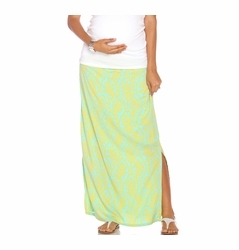 The cotton blend skirt softly hugs your growing bump for a comfortable fit. The Abigail maternity skirt is made of a 2 layers of lightweight woven fabric combined with a stretchy, smocked back waistband that is designed to expand and contract with your changing shape through every stage of pregnancy and after delivery too. The belly panel can be worn low for a knee length or you can pull it up higher for a shorter above the knee length. Bright pink and orange diamond print on a white backdrop. Easy to pack for an island vacation and can be dressed up for a party with wedges or down for a casual lunch with flip flops. Machine wash cold/gentle. Hang to dry. The Abigail maternity skirt is made of a two layers of lightweight woven fabric with an ocean blue and sunny yellow coral print. The stretchy, smocked back waistband is designed to expand and retract with your changing shape throughout pregnancy and after baby is born. The belly panel can be worn low for a knee length or you can pull it up higher for a shorter above the knee length. Perfect with a simple tank top for a day of shopping and packs easily for resort vacations. The Abigail maternity skirt is made of a 2 tiered layers of lightweight woven fabric in an eye catching bright pink and white print. The waistband has a stretchy, elasticized back panel that will grow with you throughout every stage of pregnancy and contract back so it can also be worn post-pregnancy. The belly panel can be worn low for a knee length or you can pull it up higher for a shorter above the knee length. Bright pink and orange diamond print on a white backdrop. A simple white tank top tops off the outfit for a casual look or glam it up with a dressy blouse for a dinner date. Perfect to take along on your tropical vacation. The Abigail maternity skirt is made of a 2 layers of lightweight woven fabric in a stunning jet black and white coral print. The waistband has a stretchy, elicticized back panel that will expand and contract with your changing shape throughout pregnancy and afterwards. The belly panel can be worn low for a knee length or you can pull it up higher for a shorter above the knee length. Bright pink and orange diamond print on a white backdrop. A simple tank top completes the outfit for a casual look or glam it up with a dressier blouse for a dinner date. Perfect to take along on your resort vacation. The Isabella Maxi skirt is made of a lightweight woven fabric combined with a stretchy, smocked back waistband that is designed to expand and contract with an ever-changing belly. The belly panel can be worn low for a floor length or you can pull it up higher for an ankle length. 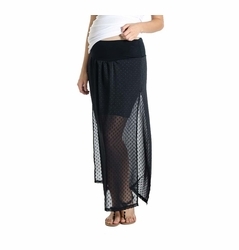 The skirt has long slits on each side for easy movement. Works throughout every stage of pregnancy and beyond. Eye-catching ocean blue and bright yellow coral print. Easy to pack for resort vacations and can be dressed up for a party or down for a casual lunch just by changing your shoes. The Audrey Front Pleat Skirt is a classic style that is office appropriate and a perfect choice for the career oriented mother-to-be. A front belly panel ensures a secure comfortable fit while the front pleat slit allows for easy movement while still providing the styling of a pencil skirt. There is an adjustable button system in the interior of the waistband that allows for adjustments as your belly grows.